We are constantly thinking of new ways for you to optimize and speed up your design workflow on Elementor. Our template library, mobile editing and stretched section features were added exactly for this purpose. Today, we are tackling another pain: Staying consistent with your brand colors. Having to switch back and forth between windows to copy and paste your site color palette can be very disruptive for your workflow. Now, you can have your site’s chosen colors saved as presets, and available on every color picker on Elementor, with the new Color Picker feature. The color picker feature is especially useful combined with our template library, or when using your own saved templates. Insert any template you want into the page, and quickly match it with your site’s color palette by using your preset colors. This set of colors will follow you everywhere on Elementor: On section and column backgrounds, buttons, headlines, image overlays, and so on. To choose the colors for your page, click on the top left hamburger icon, and then click on Color Picker. 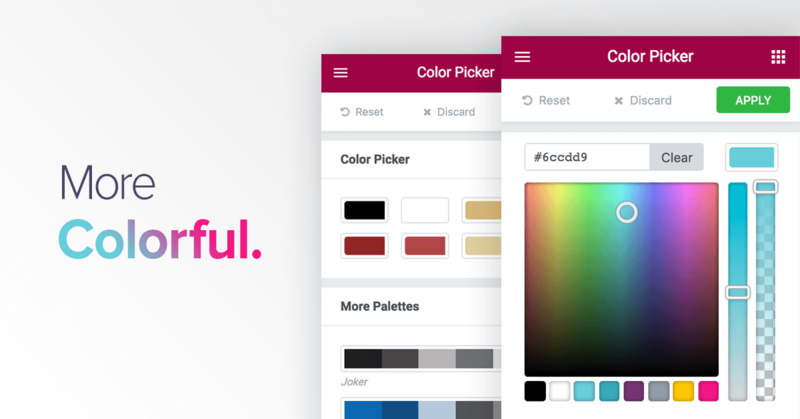 You can either choose one of the 10 nice preset palettes, or customize your own colors. We know you guys love our template library, as it can really help speed up the time it takes to design a page. It sometimes can get frustrating though, If you decide you don’t want to use a template you’ve inserted, and want to switch to another template. You have to go through all the sections of the currently added template, and delete each of them one by one. Well, now you can clear the entire page content with one click, by using the “Delete All Content” button we’ve just added. This deletes everything on the page, leaving you with a blank slate. It’s a kind of “Big Red Button”, and I’m sure you’ll find it very useful. Be careful though, you don’t want to delete an entire page and come to regret it. In Elementor, we have always put great emphasis on image design and customization. From background overlays, image size scales and box shadows, to border radius and many other options, there is almost no need to edit the images outside Elementor. Now, you can also crop the image, right on the editor itself. This feature automatically makes all the images you add with the Image widget responsive to any screen size. It fully aligns Elementor with the corresponding feature recently added to WordPress. We have improved Elementor’s compatibility with 3rd party widgets and shortcodes, by adding a new ‘Apply’ button that updates them instantly. After dragging and dropping a WordPress or 3rd party widget to the page, you can update the widget with the changes you make by clicking on the Apply button. This feature is a bit technical, but is significant for anyone wanting to migrate their site, along with Elementor, to a different domain.By switching from Serialize data storage to JSON, we have solved many issues that arose when migrating Elementor. This change also gives the added bonus of saving up to 30% of the storage volume. We know WP developers that use Elementor are anxious to get their hands on our API. Following the JSON update, plus more developments, have brought us much closer to complete the API, and we are happy to announce it will be available in the upcoming release. Thanx for the good work on Elementor. I like the “drag-and-drop” width of the blocks/columns. But would it be possible to do the same with the height??? It will make my(our) lives easier. No more marginsettings or padding. Just drag-and-drop the height as you feel like…. Please…make it a new feature…. I’ve seen some builders that allow that… Frankly I don’t like it. Editing sections, columns and widgets live on one screen is difficult enough. This will make you struggle to grasp the right layer. You can easily control the height of sections using the Minimum Height scale on Section > Layout. Not everything that shines is gold, and often having too many ‘nifty’ features is bad for UX. Great new features! Keep up the amazing work! Looking forward to the API too. Help please! I love Elementor – it is making life so much easier as I develop a site for a local charity for rehoming dogs, and while still learning how to build a site. The new updates are great, and you mention about the 3rd Party Plugin Compatability the fact that you can drag and drop from a 3rd party widget but, being a newbie, I am confused where you drag it from and where to put it once you have it in Elementor – sorry that this is such a basic question, but can anyone enlighten me! Solid new changes to Elementor. Now we are talking API, my kinda language 🙂 – look forward to that addition on top of all the great improvements and new features. You can align the heading by going to Heading > Content > Alignment and choosing center. I want to add two buttons in one column side by side but unable to do it. Is this possible? Hey guys, with the new version of elementor (0.10.2) my hover animation on images doesn´t work anymore. Is there a bug? Hi guys, it´s weird i just posted a comment, but it doesn´t show up. So again.. I use the latest version of elementor and it seems that the hover animation style on my images does not apply any more. If in the editor apply the style to an image, then it works. As soon as i save, or i try to apply the style to a second image, then it´s gone. Also it seems that there are other css classes shown on the frontend. I am pretty sure, that in the past it was something like class=”elementor….”. May it be, that there is a bug in the new version, or am i doing something wrong? Thanks for bringing this to our attention. We will release a fix for this soon. You can use the Columns widget, this will give you the option to add an inner columns section with 2 columns. You will still need to place each button in separate columns. Another option is to add a CSS class and add inline-block to the block containing the links. what typography you use ben? What do you mean? Do you mean which font family? If you use chrome, go to Chrome Store and add “FontFace Ninja”. This enables you to get name of any font on any page. How change Color Picker default in my theme functions? I have a problem with color picker. At first I selected several colors, but now I’ve changed them, but in the pages i create previously elementor shows the old colors. How the color palette can be updated? The paragraph of text that I entered into my elementor page has some words that are black, as I wanted, and some words that are grey/green, a color that I do not want for the paragraph. When I highlight the words and click on black in the font color selection, the words stay gray/green. How do I change the paragraph words to all black?